The CC&L Private Capital business development team, led by Catherine Dorazio, is changing the industry — one client at a time. 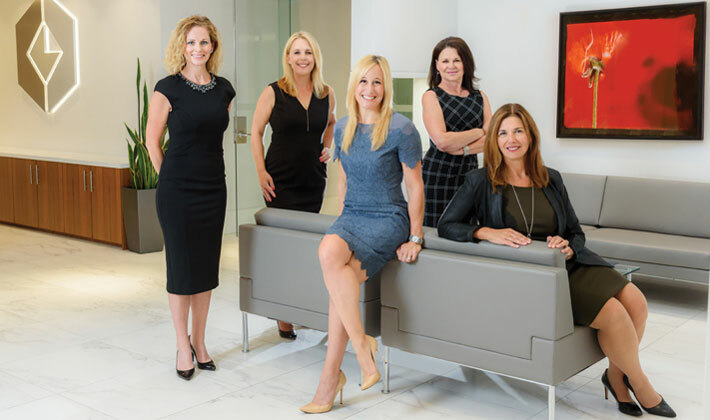 Now four-women strong, Angela Huck, Janice Sowden, Jocelyn Duncan and JoAnne Mulligan comprise almost half of the firm's client representatives in BC, along with Catherine, who is one of three managing directors leading the nationwide company that manages $7 billion of client wealth. "Bringing more women into this male-dominated industry has been a deliberate approach to hiring," states Catherine. "Women have a valued skill set of communication and deep connection with clients. They capitalize on those skills to stand out and succeed." CC&L Private Capital remains an independent firm seeking to manage $10 billion by 2020, a target that will be helped by its focus on encouraging diversity. "Women add perspective and diversity to our team. We're outpacing our peers in asset growth and investment performance, and we're recruiting more women than ever. We're doing well for the right reasons." Photographer: Anna Beaudry CONNOR, CLARK & LUNN PRIVATE CAPITAL LTD.